You are currently browsing the archives for the Eliot Seide category. 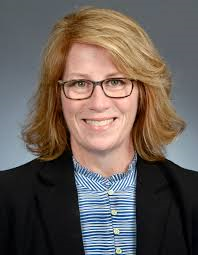 Radical DFL front organization TakeAction Minnesota has endorsed Erin Murphy in her campaign to be the DFL’s endorsed gubernatorial candidate. Follow this link to read the list of Erin Murphy’s endorsements. That’s what 21st Century socialism is sold as. A vote for Erin Murphy, Rebecca Otto or Tim Walz is a vote for full-fledged socialism. 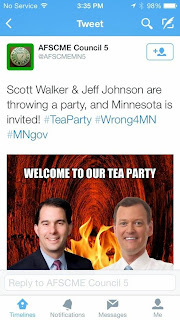 In their Tuesday statement, AFSCME Council 5 called Jeff Johnson “a right wing extremist.” That’s likely because Jeff Johnson has specialized in highlighting the times when government has spent the taxpayers’ money foolishly. That’s something that AFSCME Council 5 can’t tolerate. In fact, the DFL can’t tolerate a politician, whether he’s at the top of the executive branch or a member of the legislative branch, who spends the taxpayers’ money wisely. A politician who highlights the legislature’s spending of $90,000,000 on an office building that’s used 3 months a year might make life uncomfortable for a union like AFSCME. AFSCME supported creating MNsure, which still isn’t working after the Dayton administration spent $160,000,000 on creating that website. AFSCME was the union that insisted that child care small businesses be unionized, too. If there’s a politician that AFSCME would fight for, it’s Gov. Dayton. Most Minnesota families vehemently oppose spending $90,000,000 on a palace for part-time politicians. Jeff Johnson opposed the building, too. Gov. Dayton supported it. Most Minnesota families think that health care decisions should be made by physicians and families. Jeff Johnson agrees with them. Gov. Dayton thinks government should tell families what types of coverage they have to buy. Gov. Dayton will spend this campaign telling people he helped the middle class. If he was honest, though, he’d tell them that he strengthened special interest organizations like AFSCME. Minnesota needs a governor that sides with them. Minnesota doesn’t need a governor that agrees with Eliot Seide all the time. AFSCME and the SEIU can bargain with state governments all they want. They just can’t collect dues from people who don’t want to be part of the union. The ruling did nothing to prevent collective bargaining. It just said that people who aren’t directly employed by the government aren’t government employees. “This attack on worker rights is bankrolled by billionaires and big corporations to enrich themselves at the expense of hardworking Americans,” added Seide. The Harris case was brought by the National Right to Work Legal Defense Foundation, an extreme anti-worker group funded by the Koch brothers and the Walton family. I’d love hearing Seide explain how “billionaires and big corporations” get rich because of this ruling. I think Seide’s making this stuff up for political consumption to excite his base. If union workers don’t turn out in massive numbers for the DFL this fall, the DFL will take a bigtime hit. Actually, unions pay dues to get Democrats elected. The notion that these union leaders are great altruists is silly. Consider this the unions’ best qualifications argument. It isn’t persuasive, though it’s dripping with chutzpah. Insisting that unionized child care providers are the only child care providers providing quality care is insulting the high quality non-unionized child care providers doing a fantastic job. The women who run these in-home child care facilities are part entrepreneur, part teacher and part supervisor. That’s before mentioning a lengthy list of other qualifications these ladies bring to the table. I’d triple dog dare Seide to tell these anti-union child care providers to their face that unionized child care providers are the only qualified providers. The political party that Hubert Humphrey formed back in the late 1940’s doesn’t exist anymore. Back then, Humphrey convinced farmers and unions that his fledgling party was their home. For some time, the DFL really did represent those interests pretty well. Then came the 1970’s. That’s when the DFL started drifting away from its founding principles. Nationally, the anti-war movement caused it to drift away from its belief that America is the greatest force for good in the world. Significant-sized parts of the Democratic Party, both nationally and in Minnesota, got the title of being the ‘blame America first’ crowd that former UN ambassador Jeane Kirkpatrick talked about. The Sierra Club and other environmentalist organizations caused the DFL to become more of a metrocentric party. That’s when the biggest drift from supporting miners and farmers happened. These days, the DFL is essentially a metrocentric party. Miners’ input isn’t welcomed in the party. In fact, they’ve lost their seat at the table to the environmentalists. Environmental groups call it sulfide mining because the copper, nickel, gold and other metals are locked up in minerals that contain sulfur and can produce sulfuric acid and other contaminants when exposed to the elements. They fear toxic runoff would threaten Lake Superior and the Boundary Waters Canoe Area. And they say the environmental record of such mining elsewhere is poor. The unmistakable message to mining unions is that their industry isn’t welcome in the DFL anymore. Sens. Franken and Klobuchar told the unions that they weren’t welcome when they voted to keep construction unions unemployed. That happened when they voted to prevent the Keystone XL Pipeline from becoming reality. That’s unforgivable considering the fact that unemployment in the construction industry is 14.7% nationally. Environmentalists 2, unions still nothing. When Hubert Humphrey started the DFL, public employee unions didn’t exist. Today, they’ve achieved sacred cow status. Whatever Tom Dooher, Javier Morillo-Alicea and Eliot Seide says they want, Gov. Dayton and the legislature do without question or hesitation. The DFL is so endebted to these unions that Gov. Dayton signed an unconstitutional executive order in an attempt to unionize child care small businesses. It’s time that the DFL admitted that it isn’t interested in supporting the Steelworkers Union or the United Mineworkers. Jim Oberstar’s vote for Cap and Trade was seen by the mineworkers rank-and-file as a vote to destroy the mining industry in Minnesota. Similarly, Collin Peterson’s vote for Cap and Trade was potentially damaging to farmers. Throughout that fight, Rep. Peterson insisted that he wouldn’t hold hearings on Cap and Trade. Then Queen Nancy came calling for his vote, at which point his vote flipped. That’s when Rep. Peterson threw farmers under the bus. Today, the Democrat-Farmer-Laborer Party doesn’t exist. It’s transitioned into the Democrat-Public Employee Unions-Environmentalist Party. If you believe Denise Cardinal’s performance on Almanac, which I don’t, you’d believe that the DFL is totally content, that there’s no divisions within the DFL and that they’re rolling in cash. As Meatloaf said a generation ago, 2 out of 3 ain’t bad. Cardinal is right in that there aren’t any divisions within the DFL. She’s right, too, that there’s lots of money in the DFL’s coffers. Both things come together in a simple step. If the DFL does exactly what Alida Messinger tells them to do, she’ll promptly write a check with lots of zeroes at the end of it. The thing that’s sad is that the DFL is forced into agreeing with her anti-mining ideology. The DFL is forced into agreeing that fairness and class warfare are infinitely more important than prosperity. Thanks to Alida, the DFL is forced into thinking that the definition of marriage that’s been used by civilized societies for 5,000 years is divisive. Early in the process when it was becoming clearer that the shutdown was going to happen there was discussion between the governors office and the coalition group (a group made up of a wide variety of unions including AFSCME, MAPE, Teamsters, and others who discussed on how broad the shutdown should be. All parties agreed that for the shutdown to be most effective, that the public had to feel the pain and realize what state workers do for this State. The best way for this to happen would be a real shutdown involving many state workers, in lieu of a partial shutdown. There was no one party who came to this conclusion. The shutdown was necessary to place focus on the top 2% of Minnesotans to pay their fair share in taxes. This was explained at a statewide meeting of all local presidents. Governor Dayton supported this shutdown because he could not agree to the massive cuts to state workers and state programs, and although we did not have success with taxing the top 2% he did succeed in saving 5 thousand state jobs which were going to be lost under the Republican backed plan, and many provisions which would have ended our collective bargaining rights as we know them were removed from bills. There was much disappointment when the Governor made his decision to compromise and end the shutdown. Elliot Seide was asked to speak to our group so we could better understand the Governors decision. Elliot stated that the Governor did not take this decision lightly and was burdened by the effects the shutdown was having on state workers and the entire state on Minnesota. Elliot stated that Governor Dayton did not believe that continuing the shutdown would result in Republicans agreeing to raise taxes on the wealthiest Minnesotans. Elliot and other did attempt to convince the Governor, without success to continue the shutdown as he felt we were gaining momentum and gaining Public support. AFSCME council 5, intends to stick with Governor Dayton’s tax the rich plan and is convinced we can take control of the House, and Senate with labor friendly legislators in the 2012 elections. This is the only way we can assure our jobs, and collective bargaining right will be protected. In short, this AFSCME memo is irrefutable proof that the government shutdown was planned by the DFL. That fits with what Gov. Dayton told me at his trainwreck townhall here in St. Cloud. That’s when he said that he wouldn’t consider calling a special session to sign the transportation bill, which has almost nothing to do with balancing the budget. Mothballing construction projects in the middle of the summer didn’t just put thousands of construction workers out of work. It put important public safety projects 3 weeks behind schedule. For Ms. Cardinal to say that Republicans shut state government down isn’t just disgustingly dishonest. It’s proof that she’s a perfect fit for ABM and ProgressNow. ABM and ProgressNow are like her in that they’re only loosely tethered to the truth. According to our exclusive new SurveyUSA poll, 76% of Minnesotans say they’d vote in favor of voter ID. Only 18% oppose the idea. Issues that get 75+ percent of voters of all political persuasions to aqree isn’t a divisive issue. It’s a unifying issue. Ms. Cardinal’s dishonesty is disgusting to the point that she’s earned the Ambassador Joe Wilson Dishonesty Under Fire Award. During the Plame scandal, journalists of all political persuasions said that the best way to determine whether Joe was lying was determining if his lips were moving. Unionized day care & streamlined oversight? Day care provider Sharon O’Boyle of St. Paul Park said she and other union supporters see want a union in order to have a stronger voice when it comes to streamlining government oversight of day care facilities. O’Boyle also said she wants a stronger voice advocating for higher day care reimbursements from the state. “I want a union to work with me on issues that concern myself and other licensed family child care providers,” she said. Those issues include licensing rules and regulations, and adequate compensation for services to families. What’s interesting to me is that Ms. O’Boyle thinks that the best vehicle for “streamlining government oversight of day care facilities” is AFSCME or SEIU. When have unions streamlined anything? Additionally, Rep. Mary Franson said that she knew of at least 2 lobbying organizations while she was a day care provider. Does anyone think that unions would be better advocates for these businesses than lobbying organizations would be? It’s apparent that SEIU and AFSCME want these businesses unionized so their political influence doesn’t diminish. That’s SEIU’s and AFSCME’s worst nightmare, the thing that worries Eliot Seide and Javier Morillo-Alicea the most. The political reality is that AFSCME and SEIU wouldn’t be better advocates for in-home day care businesses than lobbying groups are. Furthermore, forced unionization of these in-home businesses isn’t likely to lower costs to parents. It’s likely to cost more. That matters considering the fact that many of the children receiving day care from these in-home businesses are recipients of state aid. The last thing we need right now is to give AFSCME and SEIU another reason to argue for more of the taxpayers’ money. What is the status of home-based child care providers under the Public Employment Labor Relations Act (PELRA)? It’s time for AFSCME and SEIU to drop this charade. Contrary to what SEIU and AFSCME say, they didn’t find the support they needed to start a day care union. If they had, they wouldn’t need Gov. Dayton’s executive order. They’d start the unionization drive by filing with the NLRB. It’s telling that they didn’t file that notice. In fact, it’s all you really need to know about the situation. This morning, I had an interesting thought about Arne Carlson. The media is so eager to tout him as a senior statesman for the Republican Party, mostly because he’s supposedly a moderate. I don’t buy the fact that Arne Carlson is really a Republican, much less a moderate Republican. I know he couldn’t identify with mainstream Republicans because he’s never identified himself with them. Let’s remember that spending increased by 56% during his 8 years in office. That’s 7% per year or 14% per biennium. That’s perfectly in line with what the DFL has historically done. Let’s remember that the initial budget passed by the DFL majority passed in 2007 would’ve increased spending by 17% for the 2008-09 biennium. How is that significantly different than what Arne did each year for 8 years? To settle this fight once and for all, I’m proposing that there be an hour-long debate during the state fair at the grandstands. Let’s have Ed Morrissey, Mitch Berg, Dan Ochsner and Tom Hauser as moderators. I’m also proposing that the debate be between so-called senior GOP statesman Arne Carlson and Assistant Senate Majority Leader Dave Thompson. The debate would be a great service to Minnesota because these moderators are straight shooters who fit comfortably within the mainstream of Minnesota politics. In addition to holding it at the State Fair, let’s have someone subsidize a live video feed for the internet for those who can’t make it to the fair. That person or company can recoup some or all of their money through advertising revenues. I don’t want this to be Arne vs. a retired GOP legislator. I want Minnesota to see the difference between politicians that once were considered moderate Republicans vs. a current conservative that’s been recently mischaracterized as a far right conservative by Eliot Seide. Let’s let Minnesota decide which person’s views are more in line with their policies, priorities and beliefs.